super high output reaches 16500 lumens and ultra-long distance goes 583 meters. The side switch is controlled all functions through easy one-handed operation. 4*Cree XHP70.2 P2 5000k LED with a lifespan of 50,000hours.Waterproofing :IPX8 standard to 2m. 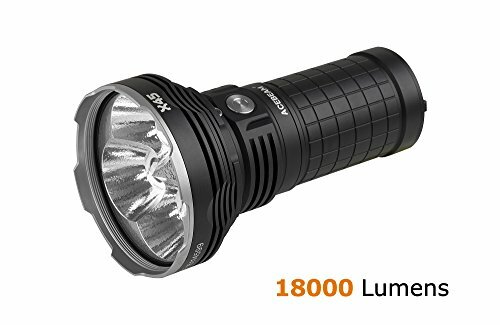 Powered by 4*18650 High Discharge IMR batteries(Included) and utilized 4*Cree XHP70 P2 LEDs,super high output reaches 16500 lumens and ultra-long distance goes 583 meters. Made of durable aircraft grade aluminium and ultra-clear tempered glass with AR coating, 98.3% transmittance, protected by a stainless steel crenelated bezel. X45 is the brightest light in Acebeam's brightest line, widely used in many fields such as search and rescue,camping,hunting and self-driving. X45 will become your invincible companion and bring you unparalleled outdoor illumination experience. If you have any questions about this product by ACEBEAM, contact us by completing and submitting the form below. If you are looking for a specif part number, please include it with your message.